If you read American Police Beat, you’ve seen countless stories about cops saving animals, kids, and all other types of people from sinking cars in lakes, burning buildings, and other deadly situations. But there are also cops out there who save lives by doing something anyone can do, whether they’re law enforcement or not—they become organ donors. In our January 2018 issue, we’ve got a story about a San Francisco police officer who managed to save eight lives with one kidney. And in Massachusetts over the holiday weekend, two parents have a lot to be thankful for. 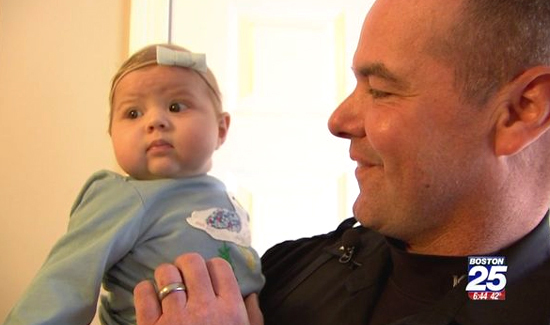 Thanks to Lt. Steven Tenney, an officer in Keene, New Hampshire, little Sloan St. James is going to make it, thanks to Tenney’s kidney and his big heart.